I would never have thought it possible. A vegan omelette. What a silly concept, but in reality it’s amazing. Groundbreaking.I’ve always thought tofu scrambles to be o.k. Tofu can never become an egg, there’s just something noticeable about the taste and texture. I’d prefer granola anyways. But this recipe over at FatFreeVegan is awesome. Taste, texture, almost creepy. I have a smaller skillet (about 6″) and it’s cast-iron. I think a non-stick would do a much better job. My omelette didn’t fold as easily because of my pan shape and material and found that her recipe made 2 omelettes in my pan. Regardless, it presented well and tasted great. I made the batter and held it for a few days in my fridge and it still cooked up great after sitting. You can’t really do that with eggs (health code violation). So I’m excited to find yet another example in life where eggs aren’t needed, necessary or missed. In the picture, I ate it with arugula and broccoli. I’ll have to try one with some of my foraged goods! Ooooh oooh oooh I have to try this! I am totally intrigued. I tried to convince Shane that we needn’t put mushrooms in them, but he didn’t seem to believe it. BTW, I love that you used a cast iron skillet when the recipe specifically implores you to use a non-stick pan. You renegade, you. 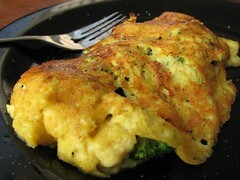 An omelette with arugula and broccoli sounds incredibly good!